(1) VISUAL SCIENCE. Nature brings us “2017 in pictures: The best science images of the year”. The spectacular total solar eclipse that swept the United States dominated headlines as it delighted scientists and the public alike in August 2017 (the composite image above shows the event’s progression as seen from Perryville, Missouri). The year also brought innovations in spaceflight and surprising insights into species past. Here are the striking shots from science and the natural world that caught the eyes of Nature’s editors. 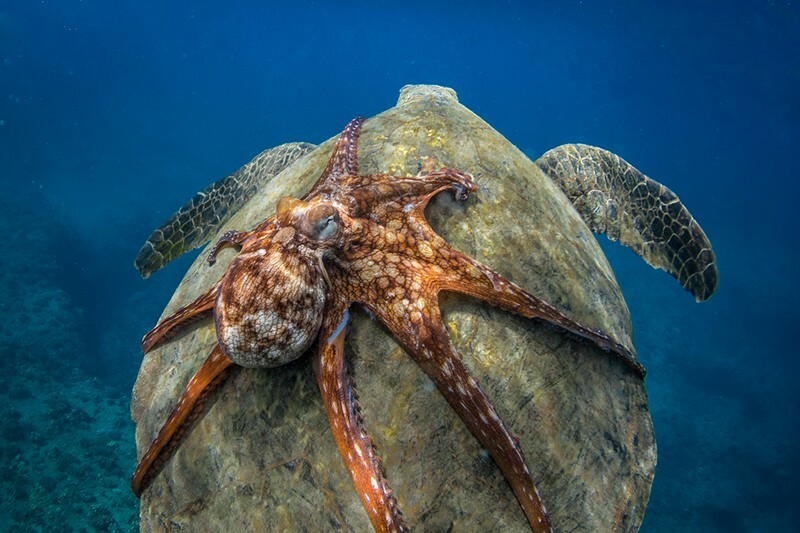 BACK-SEAT OCTOPUS: This interspecies piggyback ride was caught by photographer Michael Hardie in the waters off Hawaii. The image was a finalist in the annual Smithsonian.com photo contest. (2) SCIENCE HEADINLINES. Nature also posted this roundup — “2017 in news: The science events that shaped the year”. From political chaos to cases of sexual harassment, scientists have had a tough year. But there were also bright spots, including approval of a new type of cancer treatment and the detection of gravitational waves from a neutron-star collision…. On 12 July, an iceberg twice the size of Luxembourg broke free from the Antarctic Peninsula. It carried away roughly 12% of the surface area of Larsen C — Antarctica’s fourth-largest ice shelf. The shelf’s fate remains unclear but, if it collapsed, Larsen C could unleash glaciers containing enough water to boost global sea levels by a centimetre. (3) VISIT FROM THE GRINCH. Gavin J. Grant and Kelly Link’s Small Beer Press, which has published work by such authors as Ursula K. Le Guin and Sofia Samatar, and Sarah Rees Brennan, received its “Worst Business Holiday Present Ever”. It is hard to pay printing, royalties, artists, advertising and marketing, rent, etc. with less than 1/3 of retail. I know not everyone has a good local bookstore, a local branch of a chain, or a decent library, but if you have, *please* consider buying/borrowing books there. Am*zon still want to crush all competition (Bezos’s first name for the business was Relentless dot com) in all markets that they enter. They are fantastic at customer service, especially compared to some local businesses, but they are terrible for everyone else, suppliers, intermediaries, etc. The discount creeps up a little more every year — something has to give. I suppose it won’t be Am*zon. Guess it will be us Small Gazelle Presses who want to publish interesting books, work with a wide range of people and artists, and see if we can send these weird things out into the world and find readers. (4) EAVESDROPPING. Luckily they loved her part — “Kelly Marie Tran surprises fans discussing ‘Star Wars’ at the next table”. At long last, Star Wars: The Last Jedi has hit theaters, and those of us who were hyped for our girl Kelly Marie Tran as Rose finally got to see her get her Resistance on and join the fight in a galaxy far, far away. So what’s the verdict on The Last Jedi? What are people saying? Sure, you can go read some critics’ reviews, log on to some message boards or jump in on a discussion thread on your Facebook wall. Or you can listen in on people talking about it at the next table. That’s what Kelly Marie Tran did. (5) PRESCRPTION. Jason Sanford considers “Why the red pill doesn’t wake people to our world’s true reality”. “If you are not one of us, you are one of them.” That’s a hell of a political statement. That’s the type of statement embraced by history’s worst political movements, movements which have killed millions in pursuits of their goals. The Matrix is a great SF film, one of the best of the last few decades. But as political theory the film is extremely simplistic. After all, there’s a word for people who go through life with such an extreme “us or them” attitude: psychopaths. While simplistic “us or them” arguments resonate with many people, our greatest achievements come when we put this attitude aside. When we stand with those we have disagreements with but with whom we can still find common ground. And it’s this human determination to reach for common ground which makes me stay optimistic about the future. Because I believe in people. I believe most people try to do good and try build a better world…. (6) THE AXE. The Hollywood Reporter says “‘Dirk Gently’s Holistic Detective Agency’ Canceled at BBC America”. Never a ratings breakout, viewership was down year-over-year compared with season one. Season two averaged slightly less than 250,000 total viewers. The decision to cancel Dirk comes after BBC America bid farewell to critical darling Orphan Black in August. Short version: I’ve entered a development agreement with the really impressive production company that did “Orphan Black” – to produce The Fionavar Tapestry as a television series. There are many stages to any project as big as this one will be, but I’m genuinely happy – these are really good people, several of them with a personal passion for the trilogy (including Kris Holden-Ried, who was all-in some time ago, as it worked its way through the ‘process’). The Tapestry tells the tale of five young men and women who are brought to Fionavar – the first of all worlds. Told they are simply to be guests for the 50th anniversary celebration of a king’s ascension to the throne, each of the five discovers they have a greater, dangerous role to play as they’re thrust into a war between the forces of good and evil, whose outcome will affect all worlds, including our own. Kay draws upon a variety of creatures and mythologies, predominantly Celtic and Norse, to create the world of Fionavar, and the saga also features the legendary story of King Arthur, Lancelot, and Guinevere, heroes of medieval literature. (8) CEBULSKI STORY GOES MAINSTREAM. Marvel Comics editor C. B. Cebulski’s previous life as a Japanese comics writer, mentioned in recent Scrolls is a story that now has been picked up by the Washington Post: “The curious tale of the Marvel comics editor who pretended to be a Japanese writer”. Although it was long-rumored in the comic book world that Yoshida was, indeed, Cebulski, no one investigated deeply. Since he retired the pseudonym fairly quickly, the rumors might have died. But in November, Cebulski was named the editor in chief of Marvel Comics, arguably the most prominent job in his industry, and the rumors resurfaced. Since the comic book industry is often criticized for its lack of creators of color, the fact that its new figurehead was a white man who had pretended to be an Asian writer drew outcry. December 19, 1958 — The first known radio broadcast from outer space was transmitted when President Eisenhower’s recorded voice issued a holiday greeting for the whole world from the Atlas satellite which was launched the previous day. December 19, 1972 — Apollo lunar-landing program ends when the last three astronauts to travel to the moon splash down. December 19, 1986 – Little Shop of Horrors, the movie, was seen for the first time. 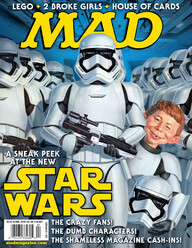 John King Tarpinian learned that Yoda has day job – from today’s Brevity. 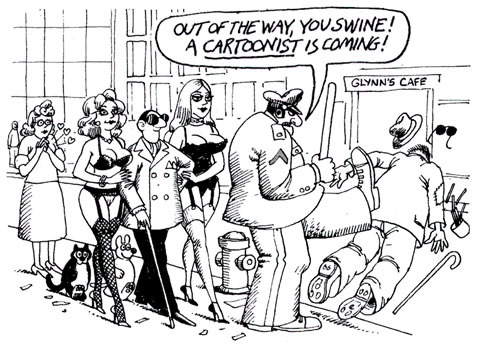 To the few hundred American oddballs who draw funny pictures for a living, there’s never been a more hilariously inapt portrait of a cartoon professional than the one described above, inked by the great B. Kliban late in his career. Many of us have a copy pinned to our walls, not to keep us humble (we have no choice), but to celebrate our forced distance from the more conventional metrics of success. As Cullen Murphy admits in his warm and graceful memoir, “Cartoon County,” comics creators have long been among the most dimly perceived of celebrities, and when they venture out into society, they are usually sized up as dentists or insurance adjusters long before the awful truth comes tumbling out. (12) TOP MOVIES. Three critics caucus to produce “NPR’s Favorite Movies Of 2017”. Genre callouts: Blade Runner 2049, Coco, Get Out, The LEGO Batman Movie, Logan, Star Wars: The Last Jedi, Thor: Ragnarok, Wonder Woman, Your Name. Also of interest: Ex Libris (Wiseman documentary about the NYC public library). Gramatik – real name Denis Jasarevic – is a Slovenian electronic music producer and DJ with a worldwide fan base. He’s become the first music artist to “tokenise” himself using the Ethereum application, Tokit. It allows users to embed their intellectual property rights, revenue and royalties into a programmable digital token. Fans and investors who “buy” the token using the Ether cryptocurrency can then – potentially – share in the revenue from an artist’s work. … When his GRMTK token was launched in November it raised $2.25m (£1.65m) in Ether digital currency in just 24 hours. The body showed no signs of “outgassing” as it approached the Sun, strengthening the idea that it held little if any water-ice. But the latest findings suggest water might be trapped under a thick, carbon-rich coating on its surface. Hey, guess what I just turned in. (16) HAVE YOU NO DECENCY? Andrew Husband, in “Porg Recipes For The ‘Star Wars: The Last Jedi’ Fans In Your Life” on Uproxx, says that porgs are not only cuddly, they’re also tasty as he shares recipes for Porg in Green Milk Sauce and Fire-Roasted Porg. Yes, you read that right. Despite being protected by several national and international conservation organizations, puffins are considered a rare delicacy in Nordic countries. And seeing as how The Last Jedi‘s porgs are based on the puffins writer/director Rian Johnson saw while filming at Skellig, it makes sense their preparation would be similar. Like “Porg in Green Milk Sauce” (as opposed to blue milk), a slight variation on an Icelandic dish in which the arctic birds are cooked with a buttery sauce rich in creamy dairy and some sweet additions. (17) OMG! The horror! Atlas Obscura investigates “Why Chuck E. Cheese’s Has a Corporate Policy About Destroying Its Mascot’s Head”. Several weeks ago, a local Patch report in Illinois revealed a seemingly disturbing underpinning of the Chuck E. Cheese universe: A former employee told the paper that a company policy required them to demolish branded items, among them the cartoon character’s head, which is part of the costume. A Patch video captured two former employees of the recently-shuttered Oak Lawn location bashing Chuck’s brains in with a sledgehammer. Why did executives at CEC Entertainment, Inc. establish a policy mandating the destruction of their business’s beloved namesake? (19) LE GUIN. NPR’s Jason Heller reviews Ursula K. Le Guin’s No Time To Spare — “Ursula K. Le Guin’s Voice Rings Out In New Nonfiction Collection”. Le Guin’s clinical, theoretical way of framing complicated social and literary ideas makes sense. Her parents were the noted anthropologists Alfred Louis Kroeber and Theodora Kracaw — a fact that doesn’t usually come up in her nonfiction. She makes an except in “Indian Uncles,” one of The Wave in the Mind‘s most heartfelt essays. She originally delivered it as a lecture in 1991 at the University of California at Berkeley, where her father taught and her mother studied. Le Guin recounts, from her point of a view, part of the events surrounding the famous case of Ishi, a member of the Native American Yahi people who became the subject of Kracaw’s 1961 book Ishi in Two Worlds. (20) EVERYBODY INTO THE POOL. The Shape of Water “Making of” featurette. (21) VIDEO OF THE DAY. “Man” is a cartoon by Steve Cutts on YouTube giving a very nasty history of the last 500,000 years. (1) THE SOUND OF MONEY. Kristine Kathryn Rusch pointed her readers to bestselling writer Michael J. Sullivan’s a post on Reddit titled “Why Del Rey and I Will Be Parting Ways” and gave a complimentary analysis on the way Sullivan handled his audiobook rights. Here, I want to applaud Michael and his wife Robin for their negotiating skills and for their attitude. To summarize the highlights of the blog about Del Rey, for those of you who haven’t jumped over to read it, Michael and Robin learned from their first major contract with a traditional publisher to retain audio rights. Michael and Robin didn’t do so on that first big contract, and then the audio rights sold for $400,000, of which Michael and Robin saw only $200,000 (subsidiary rights in a standard publishing contract are split 50/50 with a publisher). So — and here’s a nice bit of brilliance — Michael and Robin didn’t want to lose audio rights again. When the time to negotiate a new Del Rey contract came around, Michael and Robin had already sold audio rights to those books, taking those rights off the table entirely. They thought through what they wanted, and rather than argue over the rights, or get the print publisher to bump an advance, or go through all of the little tricks that people on the other side of the table do when negotiating, Michael and Robin were proactive. They made sure they got what they wanted with audio first. And there’s a lot more good information in Rusch’s post. (2) THE FLUID PAST. 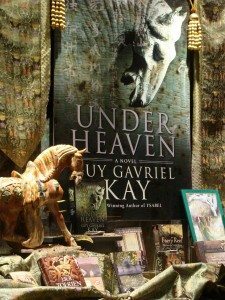 Guy Gavriel Kay tweeted a link to this article, one in which he is cited and discussed. “‘Facts are not truth’: Hilary Mantel goes on the record about historical fiction”. In Mantel’s view, the past is not something we passively consume, either, but that which we actively “create” in each act of remembrance. That’s not to say, of course, that Mantel is arguing that there are no historical “facts” or that the past didn’t happen. Rather, she reminds us that the evidence we use to give narrative shape to the past is “always partial” , and often “incomplete” . “Facts are not truth” , Mantel argues, but “the record of what’s left on the record.” It is up to the living to interpret, or, indeed, misinterpret, those accounts. In this respect the writer of historical fiction is not working in direct opposition to the professional historian: both must think creatively about what remains, deploying — especially when faced with gaps and silences in the archive — “selection, elision, artful arrangement” , literary manoeuvres more closely associated with novelist Philippa Gregory than with [John] Guy the historian. However, exceptional examples from both fields should, claims Mantel, be “self-questioning” and always willing to undermine their own claims to authenticity. (3) WEBCOMICS AT LOC. The Library of Congress now has a webcomics archive, collecting 39 strips including the multi-Hugo winning Girl Genius. This collection focuses on comics created specifically for the web and supplements the Library of Congress’ extensive holdings in both comic books, graphic novels, and original comic art. Webcomics are an increasingly popular format utilized by contemporary creators in the field and often includes material by artists not available elsewhere. Webcomics selected for this collection include award-winning comics (Eisner Awards, Harvey Awards, Eagle Awards, and Shuster Awards) as well as webcomics that have significance in the field due to longevity, reputation, and subject matter. This collection includes work by artists and subjects not traditionally represented in mainstream comics, including women artists and characters, artists and characters of color, LGBTQ+ artists and characters, as well as subjects such as politics, health and human sexuality, and autobiography. The content of these websites is captured as it was originally produced and may include content that is not suitable for all ages. (4) EARLY DAYS. Kalimac reminisces about “ Dark Carnival” bookstore. But I remember Dark Carnival from its earliest days. It was the first sf specialty store in the Bay Area, long before Borderlands or Future Fantasy and even a bit before The Other Change of Hobbit or Fantasy Etc. (Of these, only Borderlands is still with us, and it had a scare not long ago.) I found it down on the south stretch of Telegraph, the first of its three locations, when I returned to UC in the fall of 1976. It was very small then, mostly a large semicircle of paperbacks, but there wasn’t a lot to stock in those days. Jack Rems, owner ever since, was usually there, as was his first clerk, a young woman named Lisa Goldstein, who’d occasionally mention she was working on a novel. It was published several years later and led her on the path to becoming the renowned fantasy author she is today, but then she was a bookstore clerk. D. and I would hang out down there and indulge in a lot of chatter with Jack and Lisa, but we’d also buy books. (5) LA’S SHINING WEST TRIBUTE. NOTE: WE MISSED THIS ONE. On Thursday Los Angeles city officials will turn on the Bat-SIgnal. Los Angeles Mayor Eric Garcetti will light the Bat-Signal over Los Angeles in a special ceremony honoring the late Adam West, who starred in the 60s Batman TV series as the Caped Crusader himself. The ceremony will be conducted on Thursday, June 15 at 7:30 p.m. PST at Los Angeles City Hall. Garcetti will be joined by unnamed special guests for the tribute, along with Los Angeles Police Department Chief Charlie Beck. Once lit, the Bat-Signal will be projected on Los Angeles City Hall for an undisclosed period of time. (6) TRACING BATMAN’S BAT BUCKS. In “How Does Batman make All His Money?” on looper.com, Chris Sims looks at the roots of the Wayne fortune, including how Bruce Wayne’s wealth began with Revolutionary War hero “Mad Anthony” Wayne and how Thomas Wayne’s marriage to Martha Kane united a financial empire with one based on chemicals. All of this still leaves the question of where Batman gets his fortune in the world of Gotham City, but if you’ve read enough comics, it shouldn’t come as a surprise that Bruce Wayne’s infinite pile of money has an origin story just like everything else. The short version? The Waynes have always been rich. As it turns out, they’re about as old as Old Money gets in America, with a merchant fortune that came over from Europe in colonial times, growing as Gotham City expanded to form the cornerstone of an industrial empire. In 2011’s Batman: Gates of Gotham, Scott Snyder, Kyle Higgins, and Trevor McCarthy put the spotlight on Alan Wayne, a turn-of-the-century ancestor for Batman who helped to shape the city itself by funding the design and construction of bridges, tunnels, and key buildings — including Wayne Tower. I didn’t recognize the tonally inconsistent version of America presented. Perhaps the good old USA had fallen so long ago that the Sons of Liberty had cobbled together an approximation through scraps of history and lost lore. If so, this was never presented, and so instead of enjoying the action, I found myself wondering where this weird America came from. Normally, I’d be loathe to resort to the petty tactic of mentioning the “About The Author” section of a collection, but in this case it provides an important clue towards understanding why Freeman’s Stand feels like such an alien version of America. The very first thing mentioned in Hoyt’s bio is that she was born and raised in Portugal. That’s the lead-off. It’s important that you know Hoyt is Portuguese before all else. And it’s only now, after the story is concluded, that the pieces fall into place. This is a story of “Nation of Immigrants” America written by an author with a very different perspective of America than one held by a reader born and bred within her borders. That is the source of the disconnect, and I found myself wishing that I’d known from the outset that Molly’s story was that an American outsider fighting for an outsider’s vision of America. It would have resolved a number of discordant passages within the tale. The Walking Dead is a tale of sheriff Rick Grimes and his small band of survivors as they’re transformed from coddled complainers into battle tested, zombie murdering badasses. The zombie subgenre has a rich history of social commentary. Whether they be the slow walking, brain craving type or of the fast running, shrieking persuasion, the figure of the zombie has been a metaphor for all sorts of things that keep us up at night. Zombies have represented everything from mindless consumers under Capitalism in Dawn of the Dead, to fears about public health crisis in 28 Days Later, immigration in World War Z, or mega corporations in Resident Evil. And then there’s the fact that zombies originated in Haiti, where many argue it was a metaphor for slavery. Zombies are projections of our own societal fears. The Walking Dead isn’t quite any of these. Instead, The Walking Dead explores a multitude of issues, like politics, psychology, and our relationship to death. Also, the joys of cosplay. The Walking Dead is, above all else, a show about philosophical bounderies. And three in particular: (1) What constitutes life (2) What constitutes living (3) What constitutes being human. For homework, Carl recommends The Philosophy of The Walking Dead — Wisecrack Edition. Fantasist Guy Gavriel Kay and astronaut Chris Hadfield are among the latest appointments to the Order of Canada. 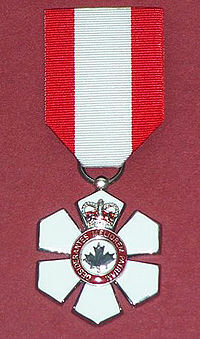 Established in 1967 by Queen Elizabeth II, the Order of Canada is awarded for outstanding achievement, dedication to the community and service to the nation. There are three grades: Companion, Officer, and Member. Canada’s singing astronaut and YouTube sensation Chris Hadfield was named an officer of the Order of Canada. Guy Gavriel Kay, appointed a member of the Order, while a young man helped Christopher Tolkien edit The Silmarillion, J.R.R. Tolkien’s posthumously published prequel to the Lord of the Rings. Kay’s own first novel, The Summer Tree, the beginning of The Fionavar Tapestry, came out in 1984. In 1990 his novel Tigana reached the Canadian bestseller list, his next book, A Song for Arbonne, debuted in the number-one position, and his subsequent novels have all been bestsellers. The world’s most lucrative prize for a work of fiction published in English is the 2012 International IMPAC Dublin Literary Award. The longlist of 147 nominees for the €100,000 prize was announced November 7. Sf/fantasy writers I recognized on the list and their nominated works are: Paolo Bacigalupi, Ship Breaker, Lauren Beukes, Zoo City, Guy Gavriel Kay, Under Heaven, China Miéville, Kraken: an anatomy, Nnedi Okorafor, Who Fears Death. The shortlist will be announced April 12, 2012, while the winner will be announced June 13, 2012. Congratulations to Toronto’s Flying Dragon Bookshop, one of three Specialty bookstores on the 2011 Canadian Booksellers Association CBA Libris Awards shortlist. Flying Dragon arguably has more than one specialty. 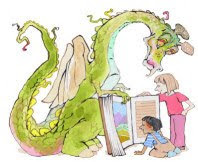 While some characterize it as a children’s bookstore, it’s also where people connect with the latest YA fantasy and general fantasy novels. As you can see, the display includes not only Under Heaven, but other mythologically minded or otherwise thematically linked titles. A new Kay tome lifts all boats, after all. The CBA Libris Awards will be presented on May 14 in Toronto. The full list of categories and nominees is here [PDF file]. Jane Yolen at Flying Dragon Bookshop. (1) Hear, hear! SFFaudio asks an excellent question: Where are are the Charles Stross audiobooks? Seriously, the guy is super talented. There have only been three commercially released Charlie Stross audiobooks (all from Infinivox). The were terrific, but they’re not enough. If Saturn’s Children and Halting State were available as audiobooks they’d shoot up to the top of my listening stack. Simon Pulse senior editor Anica Rissi has acquired world English rights to the first three books in a new fantasy series by Orson Scott Card written specifically for a YA audience; Barbara Bova of the Barbara Bova Literary Agency made the sale. (4) Do you study Google Analytics’ map of the hits on your blog? The other day File 770 got a hit from Gabarone, Botswana, the locale of the #1 Ladies Detective Agency. Spammers beware! Precious Ramotswe reads my blog. (5) The Virginia legislature has declared June 27, 2009 to be Will F. Jenkins Day. Steven H. Silver is soliciting reminiscences about Murray Leinster/Will F. Jenkins, or pieces talking about how he/his writing has influenced writers and fans, for a memory book that will be presented to Jenkins’ family. Written pieces or photos of Jenkins/Leinster for inclusion should be sent to Steven at murrayleinsterday@gmail.com no later than May 31. (6) Alexis Gilliland’s website is up and running. Lee Gilliland announces, “We are slowly adding cartoons (we have an estimated 12,000 to 15,000 total to post) and we also now have a forum.” It’s quite nicely designed. Granted releasing an e-book for the iPhone is a lot easier than writing a gaming application using the iPhone SDK. Roughly 6 out 10 of the Books on the app store sell for 99 cents or less, and 1 in 20 are free. (8) Laurraine Tutihasi’s Feline Mewsings #35 can now be downloaded at http://homepage.mac.com/laurraine/Felinemewsings/index.html. 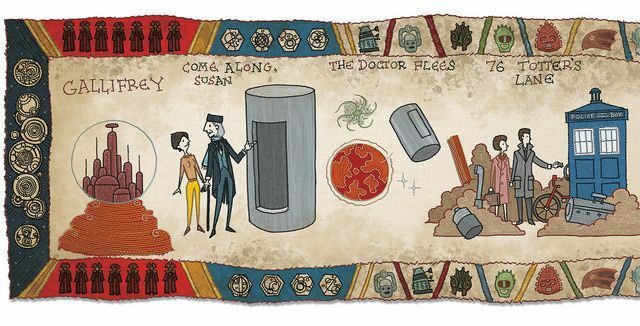 (9) Have you already heard about the Dalek found in an English pond? I got the shock of my life when a Dalek head bobbed up right in front of me. It must have been down there for some time because it was covered in mould and water weed, and had quite a bit of damage. One of the dome lights was smashed, but the eye-stalk was intact and the head and neck stayed in one piece as I carefully lifted it out.